Cobblestone School is a leader in child-centered education. It is a model of current best teaching practices to promote each student's unique intellectual, social, and emotional growth. 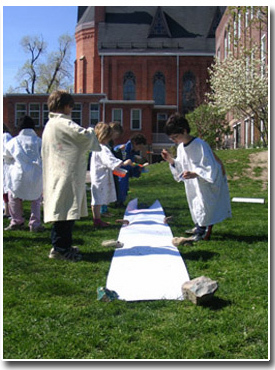 The school leaves intact and fosters each child's innate love of learning and curiosity about the world. Small classes allow the teachers to challenge each child to grow into his or her potential while participating as an active member of a learning community. Cobblestone School nurtures life-long habits of mind and heart to develop in each student the inner resources for success in academic pursuits and in life.